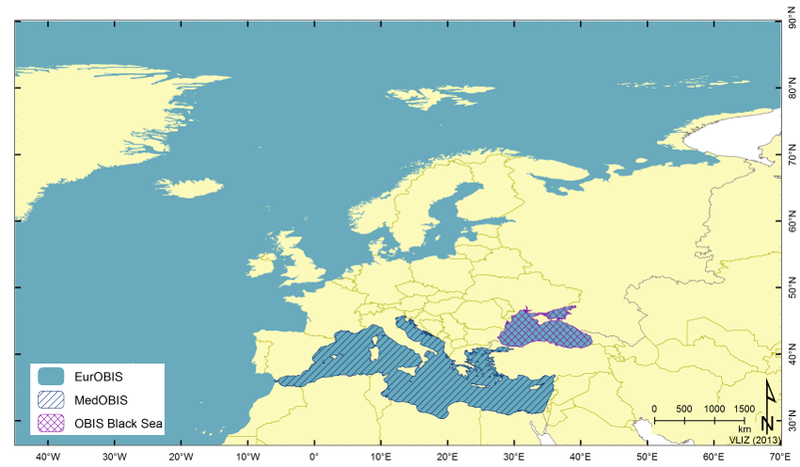 EurOBIS covers an area of about 22 million km² and includes all the continental shelf seas of Europe, including the Mediterranean shelf and the Baltic Sea. The geographic boundaries are set to 90N – 70E – 26N – 45W, but exclude the Red Sea, the Persian Gulf and the Kara Sea. These areas are covered by other regional OBIS nodes. Within the European marine waters, two EurOBIS sub-nodes have been defined, covering the Mediterranean Sea (MedOBIS) and the Black Sea (OBIS Ukraine). Both nodes specifically aim at collecting marine observational data within their region, and there is a strong cooperation between them. Although - geographically speaking - EurOBIS focuses on the European marine waters, its data capture is not limited to this. In essence, EurOBIS aims to capture all marine data collected by European institutes, even if the data was collected outside the European waters. These data are not consultable through the data portal, but are directly transferred to OBIS, where users can search, view and download them.